William James Edwards, of Oconto, WI, formerly of Streator, IL, passed away peacefully at home at the age of 85 on Wednesday, September 26, 2018, after a courageous battle with lung cancer. Bill was born on August 14, 1933 in Streator, IL to the late Henry and Ada Mozella (Potter) Edwards. As he grew up, he worked at the Edwards Grocery Store in Long Point, IL, operated by his father. Bill graduated from Long Point High School in 1953. Later that same year, he joined the Army, where he served for two years and was stationed in Darmstadt, Germany. On August 24, 1958, he married Norma Duncan in Long Point, IL. They celebrated their 60th Anniversary this year. The couple resided in the Streator IL area until his retirement from Owens Illinois Glass after 29 years, in 1994. They then lived in Missouri, just south of Branson, for 12 years before moving to Oconto, WI in 2006. Bill was a member of the Oconto United Methodist Church. 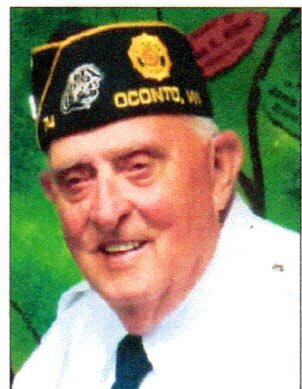 He was a life member of the American Legion and the VFW and a member of the AMVETS. His military organization memberships were highly important to him and he remained very active until his illness no longer allowed. Bill was preceded in death by his parents, and his siblings - sister Dorothy (Donald) Thies and brother Donald (Marcie) Edwards. He is survived by his wife, Norma, their children, Jo (Laurel) Edwards of Oconto, WI and Mark (Terri) Edwards of Cedar Rapids, IA; grandchildren - Megan, Nile, Kate and Luke; 7 nieces and 2 nephews. A Memorial Service was held at the Oconto United Methodist Church, on Friday, September 28th at 6:00pm. The Funeral Service will be held in Streator, IL at the Elias Funeral Home at 11am on Tuesday, October 2nd, following visitation from 9am till 11am. Burial to follow at the Long Point Cemetery in Long Point, IL. The family would like to thank the Unity Hospice staff for the care and services they provided, along with family, friends and organization members for their loving support. Memorials may be made to the Oconto United Methodist Church in Bill’s name.